One of the biggest benefits of juicing is on your health. By drinking fresh fruit and vegetables on a regular basis you are going to improve your general health. The modern way of life can really take its toll on the body so it’s important to maintain a good diet packed with as many vitamins and nutrients as possible. Juicing has been reported to have had a significant benefit to people trying to overcome life-threatening diseases. It can also have a considerable impact on your everyday life, helping you fight disease and keep healthy. Many people want to improve their general health. They want to have healthier skin, more energy and not be prone to picking up bugs like the common cold. Regularly drinking freshly juiced raw fruit and vegetables will certainly help you to do this. 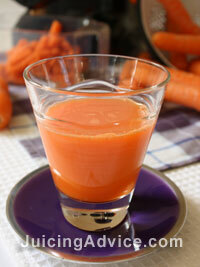 Here you can see a photo of a glass of carrot juice that took me no time at all to prepare. If you have the right type of juicer and you drink the juice straight away you are maximising your intake of fresh nutrients. Because they are all contained in the juice the body is able to absorb them quickly and easily. You are able to absorb far more nutrients far quicker than your body ever would if you were eating them. It’s all About the Living! Any process that heats or cooks fresh fruit and vegetable are reducing the amount of nutrients in the food, you’re going to get less. The great thing about juicing is you will only use raw fruit and vegetables maximising the amount of nutrients you absorb. Obviously the fresher they are the better. Juice that comes ready prepared off the supermarket shelf has to be pre-prepared, the older it is the less live nutrients that it will have to offer you. If you prepare your own fresh fruit and vegetable juices at home and drink them straight away this is the only way you are going to get all those lovely nutrients. The benefits juicing at home is that it is far cheaper than the pre-prepared variety off the shop shelf. In this photo you can see the vegetables I had in my fridge, none of them expensive but all great for juicing. What are the Benefits of all These Nutrients? Nutrients are the key to how our bodies stay functioning well. They can help to maintain our happy healthy state of mind and body. Maximising on nutrients can also help to improve your skin and reduce signs of ageing. 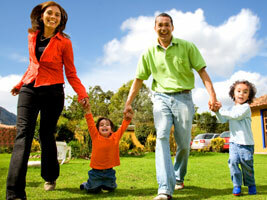 Nutrients help to give us energy level enabling us keep up with our hectic modern life style. In short they are the key to our bodies staying healthy, energised and looking good. The benefits of juicing are just as important for the old and young. Juicing can be a great way to encourage children to enjoy fruit and vegetables. Juicing machines often fascinate kids, if they can work alongside mum or dad preparing their own juice combinations they become motivated and enjoy the process. Lets face it fresh juice is brightly coloured, exciting to prepare and so easy to digest. A great way to boost your child’s fruit and vegetable intake. If you are worried about the fact that most of the fibre is removed through the pulp, then choose a great pulp recipe. By cooking something like carrot muffins or cookies using the pulp, they are going to be increasing their fibre intake as well. I know that I’m so glad that I discovered juicing. It’s given me a healthier way of life that so easy and inexpensive to achieve. Buying the right juicer was certainly vital for me. 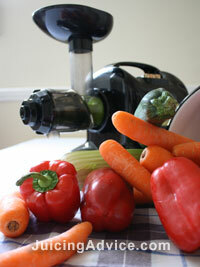 It enables me to quickly and easily prepare fresh juices with very little preparation or cleaning up time. I didn’t want to spend great amounts of money on health supplements to stay younger fitter and healthier. Me and my juicer can achieve all of this quickly, easily and cheaply. As well as having lots of fun coming up with new combinations and recipes. I hope you enjoy discovering all these benefits of juicing.